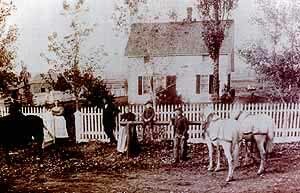 The Donelson Homestead House was the home of Thomas and Laura Aiken Donelson. Thomas came to Colorado in 1859 with the gold rush to the rockies. Thomas Donelson was from Wisconsin and staked a claim along the Platte River in an area that was near what is now the town of Brighton. Returning to Wisconsin, Thomas brought his family, which included his wife Laura and their children Mary Maria, Eleanor, Thomas, John and James. At first the family lived in a cabin along the river. However, after large flooding in 1864, Thomas began building the current house on higher ground. A visit to the Donelson House will transport you back to the 1890's, to a farmstead home with the furnishings of that time. Below are some images of the things you will see up close.